France in London | Is the French audiovisual sector following the lead of the BBC? 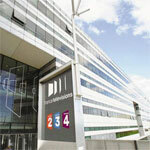 Is the French audiovisual sector following the lead of the BBC? 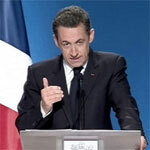 “I will ban advertising from the public audiovisual sector”, said Nicolas Sarkozy in a press conference on 8th January. Surprise!!! Nobody saw that coming… Neither Christine Albanel, the Minister of Culture and communication, nor Patrick de Carolis, the president of France Television. The French President decided that on his own, without consulting anyone. And this announcement came as a bombshell. The project was immediately criticised by the unions and the public audiovisual sector, which were afraid of an impoverishment of the public channels, followed by an unavoidable privatisation of its public service. In fact, advertising on public television and radio represents 30% of their receipts. 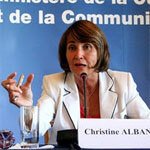 The unions announced a loss of 800 million euros (£646 million) in the budget of the public groups. And there was another bone of contention. Of course, this money would not just vanish. Just after Sarkozy’s announcement, private broadcasters were expected to grab most of the estimated 800 million euros in ad revenues draining away from public channels. The banning of advertisement was considered a “gift for private broadcasters” by its detractors, who did not forget to mention the friendship between Nicolas Sarkozy and Martin Bouygues, owner of the private channel TF1, and Vincent Bolloré, director of Direct 8, another commercial channel. These critics came mostly from the left. This is quite amusing when one remembers that the idea of an advertising ban in the public audiovisual sector came from the socialist party in the 80s, in the aim to free the public audiovisual sector from commercial pressure. But the project was never brought to fruition, since the former government thought it was impossible to finance a complete advertising ban. However, impossible is a word that does not exist for Nicolas Sarkozy. When he decides something, it has to be possible. So, he created a special commission, directed by Jean-François Copé, the president of the UMP (Union for a Popular Movement) group in the French National Assembly, in charge of finding an alternative way to finance the public audiovisual sector. And ten months later, a baby was born. The draft law was passed by the Council of Ministers on the 22nd October, and will be reviewed by Parliament by the end of November. networks. And the private channels will be allowed to broadcast 12 minutes of advertising per hour, instead of 9 now. Will the little French pupil be able to equal its British mentor? Excellence… That’s the goal. 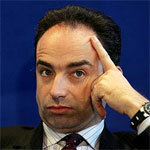 In fact, the French president wanted his public audiovisual service to follow the BBC’s model. Nicolas Sarkozy and the Copé Commission portrayed the British Broadcasting Corporation as the model of public television without advertising. However, there are a lot of differences between the two services, that won’t simply change with this reform. First, the famous “Beeb”, as the British nickname it, is better financed than the French public audiovisual service. The television licence in the UK costs £139.50 a year, while it costs 116 euros (£94.3) in France. And almost 100% of the British public pays it, against 60% of all French viewers. 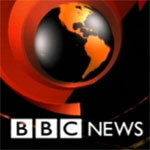 In addition, the BBC produces most of the programmes it broadcasts. And the Corporation is known for the quality of its documentaries and the creativity of its TV shows, as “Absolutely Fabulous”, “Little Britain”, or “The Office”. As a result, the BBC manages to sell its programmes abroad, and this is a significant source of income. In contrast, in France, the system of internal production has almost been completely dismantled. 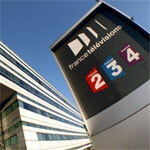 Today, only one French public channel, France 3, produces its own programmes. Picture from the movie "The trial of Tony Blair"
So, the French public audiovisual sector has still a lot to do to fulfill its objective and to follow the lead of the BBC. Is it possible that it is being just a little too ambitious?